Earlier this week, we told you that the the U.S. Treasury's Committee on Foreign Investment in the United States (CFIUS) took the extraordinary step of commenting on Broadcom's proposed purchase of Qualcomm, even though the deal had not yet been agreed to. CFIUS usually makes its pronouncements after both parties to a merger have signed on the dotted line. With its release sounding more like a research report issued by a securities firm, CFIUS mentioned its concerns about Broadcom's reputation as a cost cutter when it comes to R&D budgets, and its position as a foreign company. While Broadcom is headquartered in Singapore, it is looking to become a U.S. firm incorporated in Delaware. Still, there is much concern from lawmakers that if Qualcomm is purchased, it will force the U.S. to take a backseat in 5G development to Asian firms. CFIUS plays a role assisting the president, but it also can block a merger. So Broadcom has decided to fight back by accusing Qualcomm of having ties to Chinese firms like Huawei, and the Chinese government. This is a sensitive matter for the U.S. since the government has warned U.S. consumers to give Huawei devices a wide berth. Lawmakers say that Huawei devices transmit data from its handsets to the Chinese government. As far back as 2012, there was talk that Huawei and ZTE were spying for the Chinese. In an infographic released today by Broadcom that was more info than graphic, the company used a newspaper report from the New York Times, a quote from Qualcomm's EVP Cristiano Amon and an SEC presser to claim that the designer of Snapdragon mobile chips is working with the Chinese government, and has a "long term commitment to the China mobile industry." The infographic also includes a statement from the SEC passing along the word that Qualcomm had to pay $7.5 million to settle charges that it violated the Foreign Corrupt Practices Act (FCPA) by hiring relatives of Chinese government officials. Broadcom still has a $117 billion bid for Qualcomm and is trying to take control of the latter's Board of Directors via a proxy battle. Voting for the 11-member board was to take place on March 6th, but CFIUS requested a 30-day delay. Voting will now take place on April 4th. 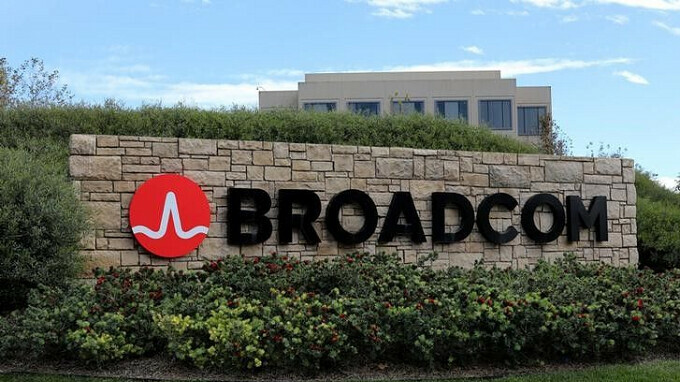 CNBC's David Faber reported this past Tuesday, that his sources felt that Broadcom would have won control of Qualcomm's board had voting taken place on March 6th as originally scheduled. But the voting might not matter at all if CFIUS wants to block this transaction. 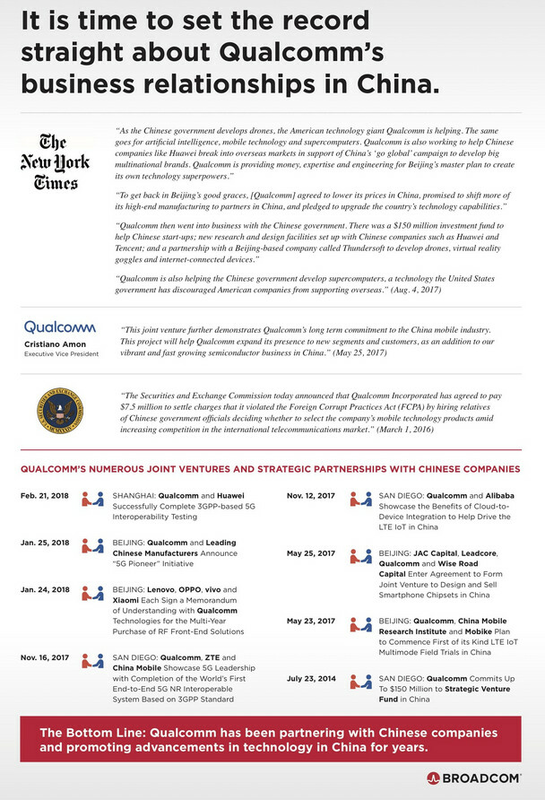 Check out Broadcom's infographic, which accuses Qualcomm of having ties to Chinese companies and the country's government, directly below. Broadcom produced this infographic to show CFIUS and other stateside regulators that it is not the only company in this proposed transaction with foreign ties. When everything fails, dirty politics. The acquisition hasn't failed it's still ongoing, just delayed 30 days. The US Gov is claiming it doesn't want Qualcomm to have ties to the Chinese due to security, yet it turns out that Qualcomm already has many ties to Chinese companys especially Huawei & ZTE who the US Gov is trying so hard to keep out of the US with it's unfounded spying accusations. Trump is just looking for a trade war. fight no win, burn his house. why is Broadcom going so hard for Qualcomm? i mean the ferocity of this fight is next level. It is no secret that Broadcom will probably make Qualcomm work with Apple again if they can pull off this hostile takeover of Qualcomm. So one must ask the question, "Is Apple using Broadcom to fight a proxy war with Qualcomm?" I said months ago that I wasn't sure who the bigger bully was: Apple or Qualcomm... they are both bully-ish companies in their own individual respects, but I think it is becoming apparent, if Broadcom is really doing all of this to get Qualcomm's superior silicon back into iPhones, and both Apple and Broadcom stand to gain from such a transaction, that the Apple-Broadcom alliance IS the bigger bully. Hahaha they failed and now suddenly they are saying crap about QC! So let's say, QC has ties to the Chinese government but when they wanted to buy there was no issue at all? Typically US company hahaha. Broadcom doesn't have issues with Qualcomm having Chinese ties. They are pointing out they do because of goverment agencies are saying that they don't want Qualcomm to have these ties through Broadcomm, yet such ties already exist. Broadcom is butthurt or what? It's hypocritical for US govt to say don't buy Huwei and ZTE phones because of those companies ties to China govt and not say anything about 50% or more of the phones used in US that have Quallcom chips in them. Qualcom agreed to fines for hiring Relatives of China govt officials.